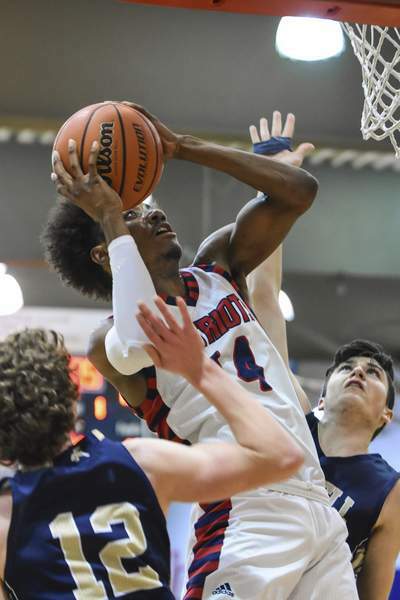 Mike Moore | The Journal Gazette Heritage guard Cameron Mitchell goes up to score two of his 14 points in the first quarter of the Patriots' win over Norwell at Heritage on Tuesday night. MONROEVILLE – Heritage hadn't faced a nonconference opponent since losing by one point at Eastside on Dec. 29. The Patriots got another nonconference thriller Tuesday night as they played host to Norwell, this time coming out with a 48-46 win in a game that included 15 lead changes. Norwell (11-6) took a one-point lead on a layup by Will Geiger with 1:06 remaining, but Alec Burton and Jason Holliness-Bell hit three of four free throws down the stretch as the Patriots improved to 14-2. The Knights jumped ahead 8-0 as Levi Leidig hit his first two 3-point attempts. That opening stretch proved to be the largest lead of the game for either side. Heritage quickly got back into the game as Jaydon Harris hit two 3s and Geiger went to the bench after picking up his second foul. The Patriots pulled within 16-12 before the end of the first quarter and went ahead for the first time early in the second quarter on a 3 by Burton. In the final seconds of the first half, Burton blocked a 3-point attempt by Leidig, but Leidig grabbed the rebound, took a few steps closer to the rim and hit a shot at the buzzer to tie the game at 22 at halftime. The teams traded baskets for much of the second half and with 1:20 to go in the game Burton hit another 3 – his third of the night – to put the Patriots up 45-44. After Geiger hit the last go-ahead shot, he also attempted a game-winner with 10 seconds to go that bounced off the front of the rim. Geiger finished with a game-high 19 points, nine in the fourth quarter. Leidig, who scored nine points in the first quarter, finished with 16. Harris led the Patriots with 18 points while Cameron Mitchell added 14. Gray said the win was a meaningful one for his team, which could face the Knights again in sectionals. “We saw it as a challenge, not only being a sectional opponent, but also an opponent that's our size,” Gray said. “Except for Woodlan, we've played 2A and 1A opponents all January in the ACAC Tournament and in the ACAC regular season.